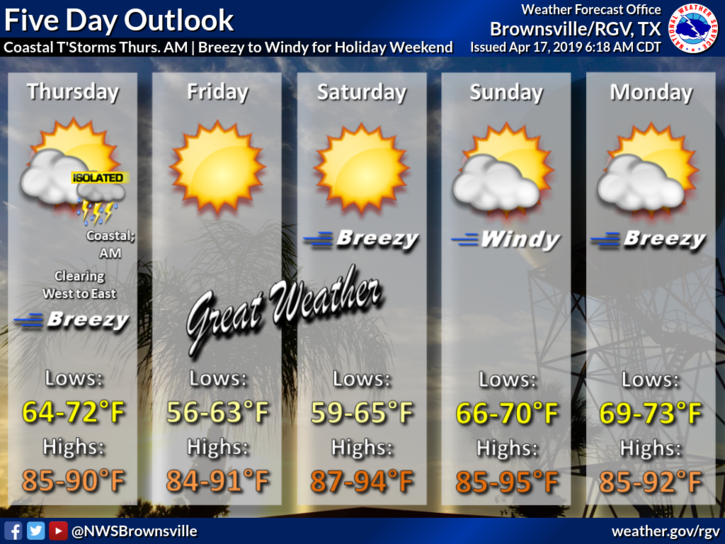 Anticipate another warm and breezy day across the Rio Grande Valley with partly sunny skies, according to the National Weather Service in Brownsville. Expected Wednesday highs will be 95 in Rio Grande City, 90 in McAllen, 85 in Brownsville and 77 in South Padre Island. There is a 20 percent chance for showers, mainly during the morning hours and in the eastern portions of the region. Also, expect a humid day. Looking ahead, Thursday is expected to feature clearing skies from west to east as a weak overnight cold front with rain showers and some thunderstorms moves offshore. Behind the front, expect lower humidity that will make for pleasant weather the rest of the week. Breezy conditions, however, will continue. Thursday highs will range between 85 and 90 degrees. Lows will be between 64 and 71.